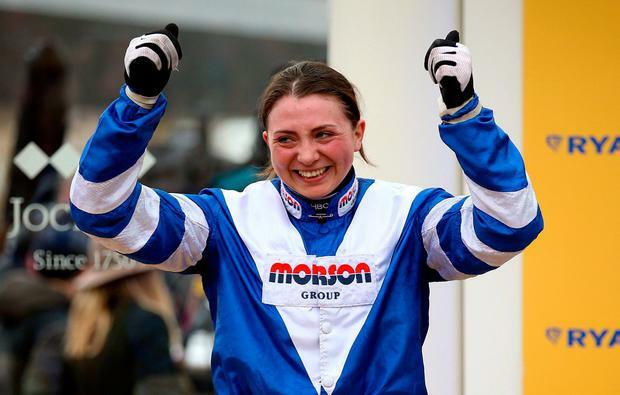 Bryony Frost became the first woman to ride a Grade One winner over jumps at the Cheltenham Festival after Frodon produced a tremendous front-running performance in the Ryanair Chase. Already a four-time winner at Prestbury Park, Frodon was a 9-2 chance stepping up the highest level, with trainer Paul Nicholls eventually deciding to run in this event rather that Friday's Magners Gold Cup. As is his wont, Frodon went straight to the front and produced some prodigious leaps under a swashbuckling ride from Frost. The challengers were queuing up from the home turn, but one by one Frodon saw them off - battling all the way up the famous hill to prevail by a length and a quarter. "What he's done for me and the dream he has just made come through for me is just incredible"
Aso ran a fine race to fill the runner-up spot, ahead of Road To Respect in third. Frost said: "My god, he jumps and just at that minute when he got overtaken, most horses would quit, but he grabbed me by the hands and said, 'don't you dare give up, don't you dare not send me into the last - I want this more than you, now come on, where are you'. "Just look at what he's done there - deny that he just loves racing. He's unbelievable. "He just made the dream come true, it's just incredible. He will deserve every single high five, pat and carrot." Frost was already a Festival-winning rider, having landed the 2017 Foxhunter Chase as an amateur aboard the Nicholls-trained Pacha Du Polder. She broke her Grade One duck later that year when steering Black Corton to success in the Kauto Star Novices' Chase at Kempton on Boxing Day - emulating Lizzie Kelly, who became the first woman to ride a Grade One winner over fences on Tea For Two in the same race two years earlier. Frost had steered Frodon to three previous wins at Cheltenham, as well as his victory in the Old Roan Chase at Aintree earlier this season. She went on: "He wasn't for passing today, not Frodon, not today. He just gives his all and he knows this place so well. "The support we've had from the crowd, coming in, was amazing and he knows it's all for him. "There was a lot of talk about the Gold Cup, but I left that all to Paul, he'll always do the right thing, my job is to ensure the horse has the most successful career possible. "I must thank Paul and the owners Mr and Mrs Vogt for sticking by me once I'd lost my claim, it would have been easy to put someone else on. "This is a big team effort and I'm just so pleased it's all come together." Nicholls said: "That was awesome, I've lost my voice a bit. She (Frost) deserves it. "He hasn't been easy to get right, I knew he had to be 120 per cent and in the middle of last week me and Clifford (Baker, head man) felt he was a gallop short so we took him to Wincanton on Friday and that put the finishing touches on him. "I said there was no point getting in behind, just make all and keep saving a fraction and have one go from the back of the last and that was brilliant. "He's massively improved this year, we worked out how to get him right and it was perfect. "It wasn't difficult to run in this (rather than the Gold Cup) after the rain, you need to stay three miles for this anyway. "Next year we might look at something different." Noel Meade, trainer of Road To Respect, said: "It is obviously disappointing to get beat. He ran a very good race. He made that mistake at the third-last and you would have to think it knocked the stuffing out of him. "If you are going to win a Ryanair you can't make mistakes like that. I thought the trip and ground were fine and that we made the right decision not to go for the Gold Cup. "He didn't get home in last year's Gold Cup and all along we have thought about coming back for this. We thought we had him in tip top shape and he has run his race. "Hopefully his season is not finished. There are a couple of places he could go. He could go to Liverpool or there is a two-and-a-half-mile Grade Two at Fairyhouse, then there is Punchestown as well, so there are heaps of options."